I’m finally back to organizing my digital photographs taken over the years. I daresay I have thousands since I bought the camera a few years ago, compared to the hundreds I took over the years with my old simple box cameras or the 36mm I received as a Christmas gift only in the 1990’s, all relics now but packed away somewhere for posterity or whatever. One of the pleasures of this sometimes cumbersome task is having the time to enjoy and “relive” some of our old road trips. And one of the things I like most about road trips is having the time to check out historic districts of old towns like Franklin, Idaho. Now tell me how many times this week you’ve heard reference to this historic old town? See? That’s what I mean. Exploring old towns like this provides a little flesh for historic facts. These were taken during a little side trip from an October 2008 visit to explore the site of the now infamous battle at Bear Creek in Idaho. On January 29, 1863 the United States Army attacked Shoshone gathered at the confluence of the Bear River and Beaver Creek (now Battle Creek) in what was then southeastern Washington Territory. 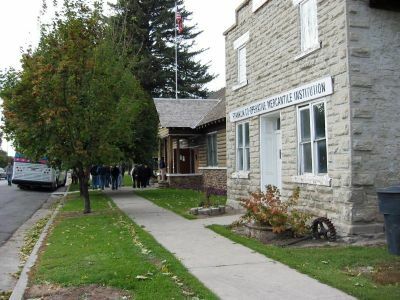 The site is located near the present-day city of Preston in Franklin County, Idaho. Colonel Patrick Edward Connor led a detachment of the US Army as part of the Bear River Expedition against Shoshone Chief Bear Hunter. That story in itself is much more worthy of a post of its own than a mere mention in this one. One day, when I’m finally able to locate them in the hundreds of transferred files from my old computer to this new fast one, I’ll fill in the hollows of your memory of massacred American Indians during the (re)settlement of the wild old west. 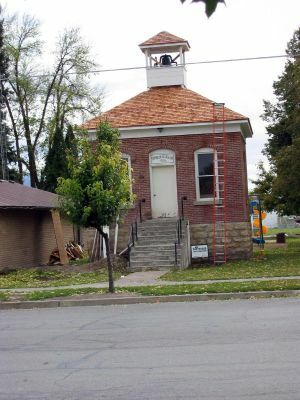 Franklin, Idaho has the distinction of being Idaho’s oldest town. 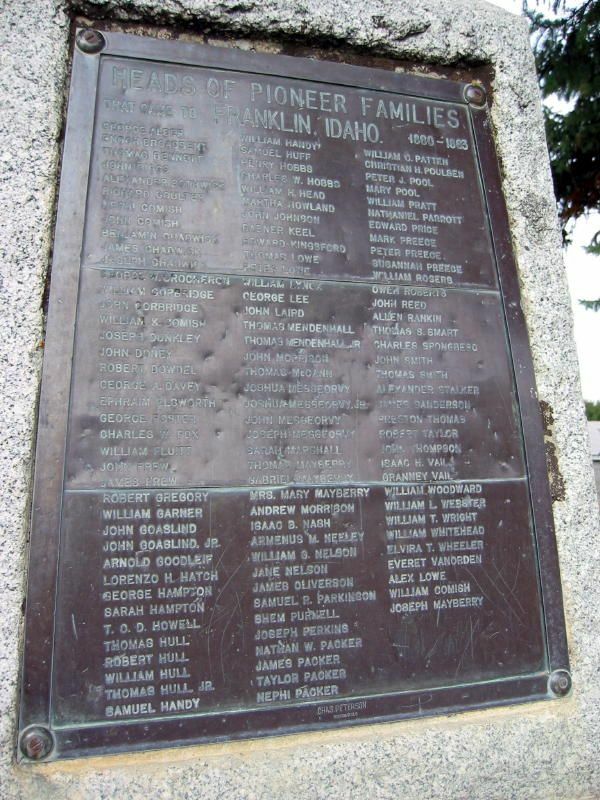 The following picture is one of a plaque containing the engraved names of the heads of families that occupied Franklin from 1800-1863. Two names stand out among the GOODLIEFS, the HATCHES, HULLS, PATTENS, and the MAYBERRYS, POULSENS, and SMARTS, to name just a few, and those are SARAH HAMPTON and MARY POOL. These names, remember, are the “heads” of households. In that era women as heads of households were rare, something like five percent of households, which compares admirably to that of four to six percent nationally. There are several interesting old buildings in the historic district. Originally built in 1904 as a town hall, this neat brick structure later became a jail. Every town–regardless of whether it was settled by Mormon pioneers or good southern Baptists–needs a jail. They’re always an interesting feature of a town. This stone building houses the Franklin Cooperative Mercantile Institution. It was one of the first ZCMI department stores in the country. ZCMI stands for Zions Cooperative Mercantile Institute and was founded in 1868 by Brigham Young. 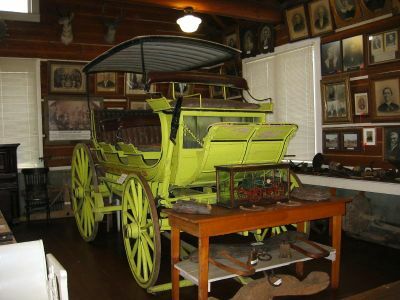 In the early 1900’s Franklin native Elliot Butterworth began buying up his neighbor’s–original town settlers all–old things at estate sales as they began to die off. 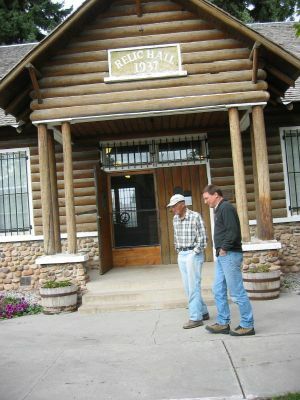 As his collection of old relics grew, he opened the town’s first museum in 1918 in this building and called it Relic Hall. In 1937 the museum was moved into its present location next door. Come along inside with me and I’ll show you a few of the old relics that happened to catch my eye that day. 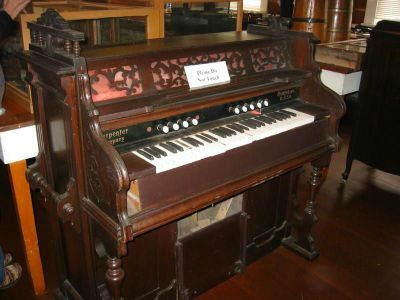 We’re greeted right up front with what appears to be a pump (or bellows) organ manufactured by the Carpenter Organ Company which was viewed as one of the leaders of the industry along with another organ name we still recognize today, Kimball. Of course any respectable family of the day aspired to a fancy horse drawn buggy like this one. These carriages were designed for private passenger use and for comfort or elegance, though some were also used to transport goods. Betcha never expected to see a picture of Elizabeth Taylor in this post, did you? 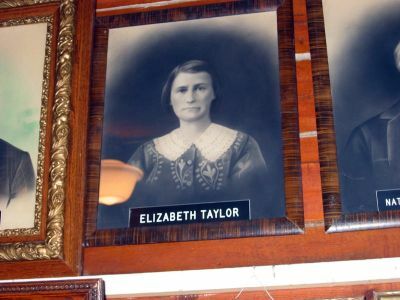 Compared to many of the other ladies lining this portrait wall, Miz Taylor was most likely considered quite the beauty in her day and time. Consider, for instance, Miz Mary Benson (last name unknown). I know this sounds catty but I don’t mean to but, if this woman’s appearance is typical of the plural wife of the time, it begs the question whether the practice of plural marriage produced women who looked like her (I’d be bitter myself and damned if I’d try to pretty myself up) or was it the other way around? According to some historians, the Mormon church secretly practiced polygamy beginning in 1835 around the time Joseph Smith first claimed the revelation that demanded its institutionalization. (Unknown of course to his first wife, Emma.) In 1852, long before these relics were collected, it was practiced openly until 1890 when the church officially abandoned the practice. 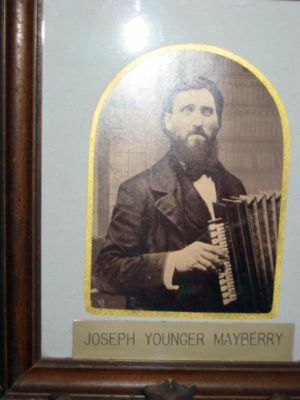 This gentleman holding an accordion is Joseph Younger Mayberry, one of the names on the list in the top photograph of heads of households, and is probably typical of the men in Franklin during its development. He would have had to play that accordion P R E T _ T Y darn well for me to have given him the nod. In all fairness, I don’t think I would have been his type–my impertinence–as evidenced by this post, and my (nearly) bald head and all. As you can see, going through these old photographs (even if they were taken in 2008) transport me to another time and place. They bring up reflections about what things would have been like in a pioneering town like Franklin. What were the roles of the women, were they that much different from mine when I was born a hundred years–more or less–later? One thing I know for sure. Relics collected from the old days around the country are very much the same as they were in the southeastern part of the U.S. where I grew up. I hope you enjoyed our little look at these odds and ends from the oldest town in Idaho, Franklin. Maybe you can visit it yourself sometime, thanks all those good people from the old days who saw ahead far enough to realize the importance of preserving the remnants of their past. They serve to reminds us we’re not that much different after all. This entry was posted in International Travel, musing by Alice. Bookmark the permalink. Gosh those women look severe! Mind you, it took a long time to take one photo and there was no Photoshop to help either! 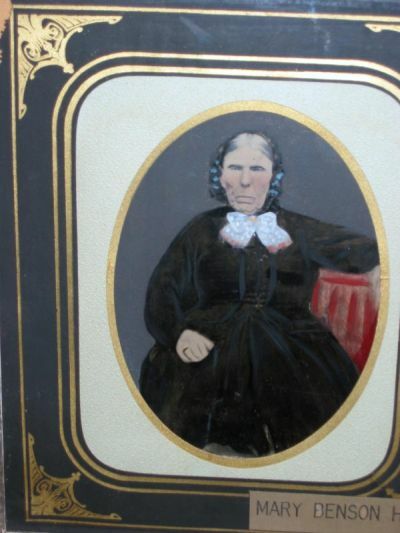 I think Miz Mary Benson’s countenance was distorted due to a lack of teeth and the need for Maalox. One hundred years ago, Mr. Mayberry could have swept you off your feet with his dazzling musical talents. By the standards of the time, he probably was considered to be “a catch.” I wonder how people will view us in 100 years? I suspect they will wonder and laugh at our archaic housing, transportation, medical treatments, clothing, behavior, etc. In Karmic law, which is the only law in life that makes sense actually, I’ll be paid back in full for my catty attempt at humor a hundred or more years from now when our futures generations walk into the equivalent of today’s Cracker Barrel or Buca di Beppo restaurants and our senior class photos hang on the walls for the amusement of the patrons. Everybody deserves their eventual comeuppance. What do you suppose all those people on restaurant walls (and museums) did in their lives to deserve hanging there for gawkers like me to laugh about?! Yes, I too was forced into organizing my photos. LOLO What a mess they were. I now have them by year and by topic. Same topics year after year except for the trips. Bay, beaches, kids, grandkids, autos….that sort of thing intersperced with the yearly adventures like “Comic Con”, or road trip, or cruise 2010. We can hope, anyway. Mage, it’s all your organizing and making photobooks and the like that got me into this trouble in the first place. I think your brain is better at organizing. I’m hoping to steal your ideas about file headings though. By year makes a lot of sense. You should see some of my old files–night scenes from the balcony, for instance. When? What balcony? and more importantly when I’m gone the grandkids will say “Who the heck cares?” 😀 Have fun spending that inheritance! Whenever I am confronted by these kinds of artifacts I am again grateful that I live in an urban situation, now, with machines that do lots of work for me and enough money to get by. It could be so much worse. And I don’t know what I’d do without Photoshop! Meow! How’s this for catty…Miz Benson could be a distant relative of Camilla Parker-Bowles. For that comment, my eighth-grade class photo, which clearly shows my acne and over-permed hair, will hang prominently in a 22nd-century McDonald’s. 1. Read a wonderful essay by David McCullough who believes our forefathers and mothers would view us pansies as “hot-house” flowers because we are either pampered sorts or can pretty-up any ravages life besets us. 2. Mark Twain observed in ROUGHING IT that Mormon polygamist men should be pitied versus envied for taking on even ONE Mormon woman, let alone 2, 3, etc. I don’t think Mr. Clemens claimed those ladies’ faces could stop a train, but that was the implication. 3. I’m an Idaho girl and SO appreciate revisiting my beloved state’s past. Thanks, Miss Alice! And have a great day. You saved me! I’ve been mentally blasting myself for writing such a mean post about those nice old people yesterday. Glad you forgave me enough to see through my attempt at humor. As for Mr. Dave McC, he’s absolutely right. I would have made a lousy pioneer. I would never have made it across the dessert in the first place, and indeed might have provided food for the vultures along the way. Further, I expect Mark Twain was half right.You’re an Idahoan? Oh, one more thing – that carriage is a brighter version of my 1963 VW Bug and is the same hue as my favorite summer purse. Them-thar people were a colorful lot! Your ’63 VW still runs? What a treasure! I used to drive one too, but I’m sure it’s long dead. If your favorite summer purse is the one with the big flower all over the whole side, I saw the picture of it on your blog, and there’s an accessory shop in Fashion Place Mall that has them in all kinds of bright colors. It’s really beautiful, but I’ll stick to my tiny little travel purse I have around my neck so I don’t lose it! When you’re done organizing your photos, will you come do mine? I love having you back, tripping through history. It’s fun! If you’ll pay my travel expenses plus room and board. We could go that basket place in Vermont! and those farmer’s produce markets–I love those places–maybe do a run into Canada, and then I’ll organize your photos. It’ll only take five or ten years. I have the feeling that I could learn a lot at your knee–if I were young enough to and agile enough to get down on them to sit in front of your knee–but for now I’ll enjoy the thoughtful comments you provide Dr. G. I’m always happy to have them. They add a certain air of legitimacy to my sometimes silly posts. Hope the wrist injury is completely healed now and you continue your summer without further incident. Thanks so much for stopping by.